We need to go buy a lottery ticket or something. 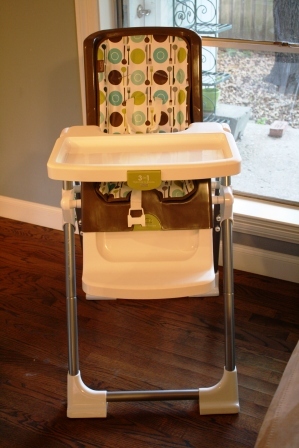 When I was pregnant, Dwell Studio did an awesome line for Fisher-Price featuring a high chair that was not at all cutesy or obnoxious (unlike 99.9% of the baby stuff out there). Unfortunately the line was long gone by the time Jack was born, so since then we’ve been on the lookout for a reasonably priced, contemporary high chair. Guess what Brian spotted at Big Lots (of all places) yesterday???? 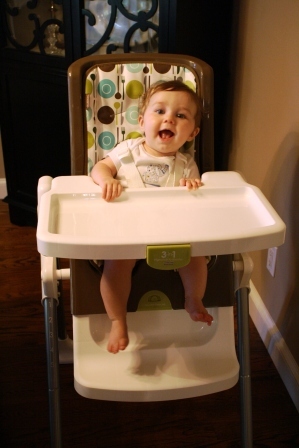 The Dwell high chair! Jack looooved sitting at the table with us tonight. He ate his mashed sweet tater and tried to join in the conversation. So not only the high chair, but I’ve had my eye out for a jog stroller for the past couple of months. Unfortunately the reputable brands will run you around $400… but we just found a Baby Jogger jog stroller on Craigslist for $40! We’re picking it up tomorrow. So yeah- apparently it’s our lucky week. I thought we were out of fruit this morning. THOUGHT. But then I opened the freezer and saw a big bag of frozen cherries (see? see? lucky!). 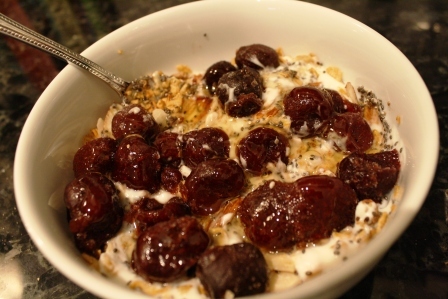 So I mixed those with plain yogurt, granola, chia seeds, almonds and honey. Lunch = time to get creative. 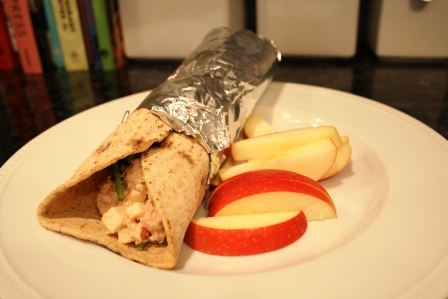 Luckily we had a can of tuna in the pantry, so I made a quick tuna salad with olive oil mayo, sweet relish and chopped apples. Spread on a Flat Out with spinach and bread and butter slices. This afternoon we tagged along with my mom to Sam’s Club. We let our Sam’s membership expire and I’m kind of regretting it. The produce deals can be amazing (2 lbs of fresh blueberries for $5, tub of organic baby spinach for $3), they carry big containers of Sabra, and the goat cheese is super cheap. Are those enough reasons to renew our membership? I’m still holding out for a Costco. For some reason I’ve been itching to make my own BBQ sauce, so that seemed like a good way to utilize the peppers. Be warned: This has quite the kick to it. If you like a milder sauce, just use one chipotle. Combine all ingredients in a saucepan. Bring to a boil. Reduce heat and simmer for 10-15 minutes. I basted pork chops in the sauce and then just tossed them in the oven (and subsequently overcooked them). Oh well, at least the sauce was good. 1. 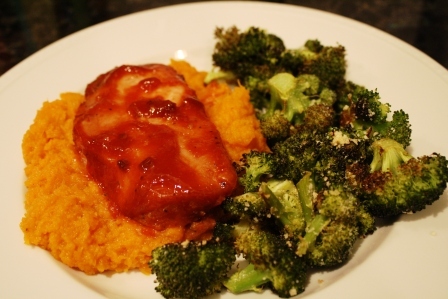 Cook sweet potatoes until very soft. I just zapped them in the microwave for about 10 minutes, but you could bake them as well. 2. Once potatoes are cool enough to handle, scoop out the insides into a medium bowl and mash with a fork. 3. Add butter, syrup and adobo sauce to potatoes and stir until combined. Add salt & pepper to taste. Every night I’ve pledged to be in bed by 11 and it has yet to happen (it’s 11:10 right now and I still need to upload pics). There are not enough hours in the day. Favorite type of BBQ sauce? TX tomato-based? NC vinegar-based? Or do you just go crazy and favor the SC mustard sauce?? This entry was posted in July 2010 and tagged BBQ, Jack, Recipes, Sauce. Bookmark the permalink. Chipolte peppers are the bomb! I always come up with a million different ways to use them. Last week, I used them to make a smokey salsa. So good! The next time you have some chipolte peppers left over, I’ll give you that recipe for the peanut sauce that we had on chicken skewers at your shower. That stuff is so good. Is it ok to brag about a recipe if it’s not mine? Miller and Jack have the same high chair! We love ours – it’s held up really well. 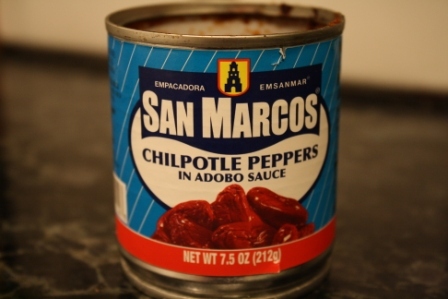 I love smoky bbq sauce with chipotles. I’m pretty sure chipotles make everything taste better. Hold out for Costco. Be strong. The closest Costco is like 15 miles away. That’s not too far, is it? Maybe I should just pull the trigger.